States' Refusal To Expand Medicaid May Leave Millions Uninsured : Shots - Health News The idea was that Medicaid would expand to include people not covered under the Affordable Care Act. But many states have chosen not to expand coverage, despite financial incentives from the federal government. That may leave millions of people without any health coverage at all. But even if the team gets the website working as it should, millions of Americans may still log on to discover that they aren't eligible for any health coverage at all. And that won't be due to any technical glitch. It's because their state has decided not to expand its Medicaid program. This is not the way the health law was designed and enacted, says Bruce Siegel. "Originally the idea was that millions and millions of Americans would get health insurance," says Siegel, president and CEO of America's Essential Hospitals, a group that represents safety net institutions around the country. "They'd get coverage through Medicaid or through private insurance on the exchanges." Currently in most states you have to be a child, pregnant or disabled to get Medicaid. The health law was supposed to change all that — expanding the program to include nearly everyone with incomes up to about 133 percent of the federal poverty level, or about $15,000 a year for an individual. But in the summer of 2012, when the Supreme Court upheld the health law as constitutional, it did something unexpected, Siegel says. 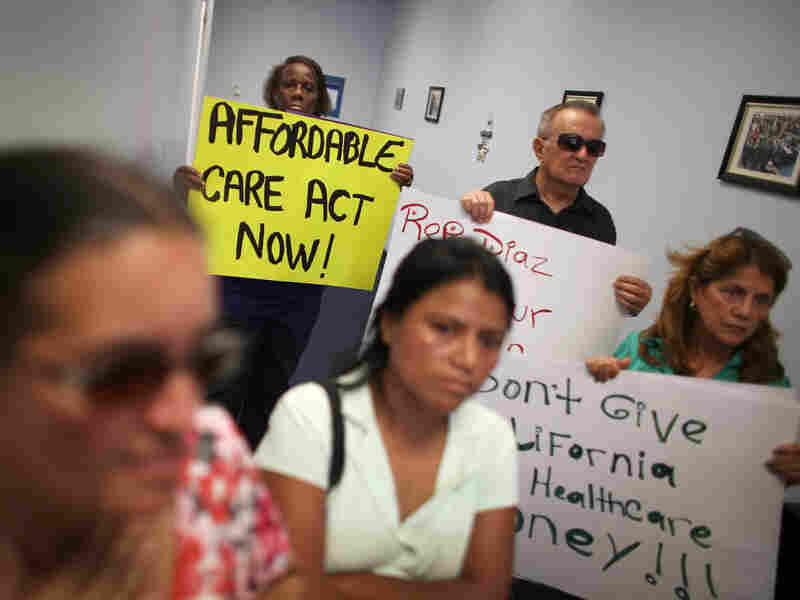 "They said states had the option of expanding their Medicaid program or not expanding it. And that led to a very, very different landscape than what we expected." Even with Ohio's decision earlier this week to opt in, still only half the states have said they will expand their Medicaid programs, even though the federal government is paying the entire cost of the additional people for the first three years, and 90 percent going forward. As a result, according to the Urban Institute, between 6 million and 7 million low-income uninsured adults live in states that are so far not expanding their programs. And some of those states have among the largest populations of low-income uninsured people. "Over 3 million of them live in just four states," says Genevieve Kenney, senior fellow and co-director of the Urban Institute's Health Policy Center. Those states are Florida, Texas, Georgia and North Carolina. The problem, says Kenney, is that for many of those people the law offers them nothing. Because they were supposed to get Medicaid, they're not eligible to buy private insurance at the exchanges unless their incomes are above the poverty line. That's about $11,000 a year for an individual. "I think it's going to be confusing for individuals who are applying for coverage," says Kenney. "It certainly makes the message about the new affordable coverage that's available a lot more complicated to target." Among the people who could get left behind is Ellen Wall. She's a nanny and sometime music teacher from Atlanta. She says her income fluctuates, but most years it's right around the poverty line. She says as long as she can pay her bills, she doesn't mind earning that amount. "I love doing what I do because I'm very good at what I do, that's why I've chosen this profession," she says. "But there are those years when it's quite lean and then I'm just barely making it. And what am I gonna do if something comes up and I'm really sick and I need some help?" Wall doesn't have and hasn't had health insurance. She says that was a real problem a few years back when she was in the hospital after an asthma attack. "It was kind of a very embarrassing situation to be in, not to have the health insurance that could have covered that few days that I was in the hospital," she says. If Wall lived in a state expanding Medicaid she would clearly qualify. But so far, Georgia isn't. And her income may or may not be high enough to let her qualify for help buying private coverage on the state's exchange. So she'll likely remain working, poor and uninsured. Most advocates say people like Wall should turn to community clinics and public hospitals if they can't get insurance. But there's a problem there, too, says public hospital advocate Siegel. The health law cut funding for public hospitals because it assumed so many more people would have insurance. But in those states that aren't expanding Medicaid, the need for free care is likely to go up instead of down. "Many of these hospitals will be overwhelmed," Siegel says. "Some of them are already overwhelmed; many of them are already losing money, providing a high level of service to people in need. And this will simply not be a tenable position." Public and other hospitals are among those lobbying hard for Medicaid expansion in the states that so far have opted not to expand their Medicaid programs. Some states are still considering opting in. But in others, patients left behind may have to scramble even harder to find care if they get sick.